Already this year we've had Kiddie Kevlar stab-proof school jumpers and manufacturers considering adding tracking devices to school uniforms. 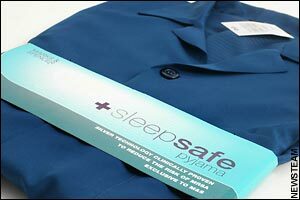 Now, the Telegraph reports that Marks and Spencers are marketing pyjamas that they say will protect you against hospital infections. All of these are just the more egregious examples of people having to pay to protect themselves from the incompetences of the state. Law and order isn't effectively maintained so people hire private security and kit their kids out like a Securicor van. Hospitals are full of infections so people go private, go abroad or - if they can't afford to pay twice - buy protective pyjamas. School standards are shockingly poor so people send their children to private schools or hire tutors. We have to pay for schools, police and hospitals. Those - politician managed - services fail to deliver and then we have to pay again to actually get the security we need, the educational standards we expect for our children and treatment without the risk of leaving hospital in worse shape than you entered. Isn't it shockingly unfair that people are forced to pay for public services that are so bad they then need to spend more of their money to prevent or undo the damage?